The lovely fella lives in the Silicon Valley. The first time I visited him here was when I had just gotten back from India in July of 2009. I kept noticing a ton of Indian markets, restaurants and shops. I’m not sure if it’s because I had India on the brain or there are legitimately just a lot of Indian places! Apparently, the Silicon Valley (or the South Bay in general?) has a large Indian population. So for yet another addition to the January Recipe Challenge, I decided to make something Indian! Indian is probably one of my favorite foods, I love everything from curries to dosa, but I’ve always been too scared to make it as it seems really daunting. With the availability of Indian products and the January Recipe Challenge as my impetus, I sucked it up and decided to try making something Indian. Tonight, I actually made two recipes! 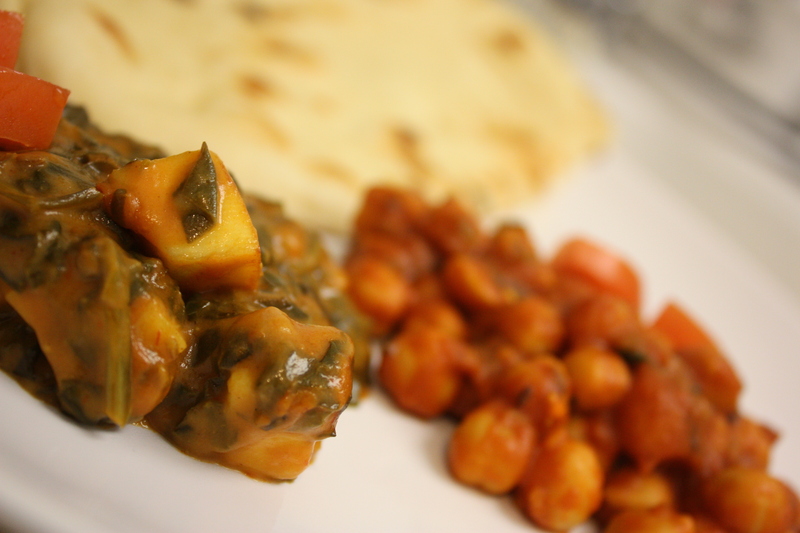 Palak Paneer (Spinach and Cheese) and Channa Masala. Both are fairly common at any North India/Punjabi restaurant. They are also vegetarian! Actually in case you didn’t know… A lot of people in India are vegetarians for religious reasons. I found two great recipes from Manjula’s Kitchen. I really liked her site because she had videos of her making the recipes! This inspired great confidence in her! Just as in the Swedish recipes I made earlier this week, I had to make due with the appliances the lovely fella has, which means no measuring cups or spoons or a blender which was kind of necessary. I had to eyeball it all but surprisingly it turned out really well! So here are the recipes with the tweeks that I made to them (remember I eyeballed these amounts). 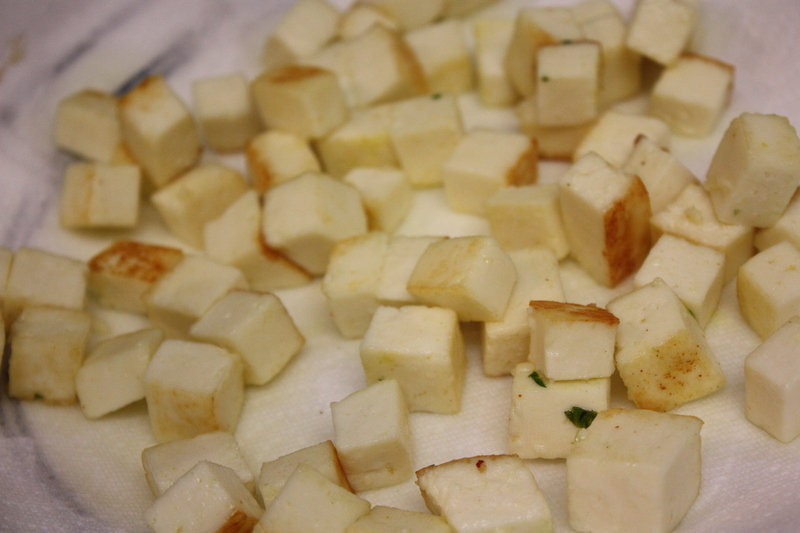 First we quickly browned the paneer in a bit of oil and then set aside. Then we added a tad more oil (probably a total of 2 tbsp, you really don’t need to add more in my opinion…) and added the spices (coriander, turmeric, cumin seeds) and cooked those for about a minute. 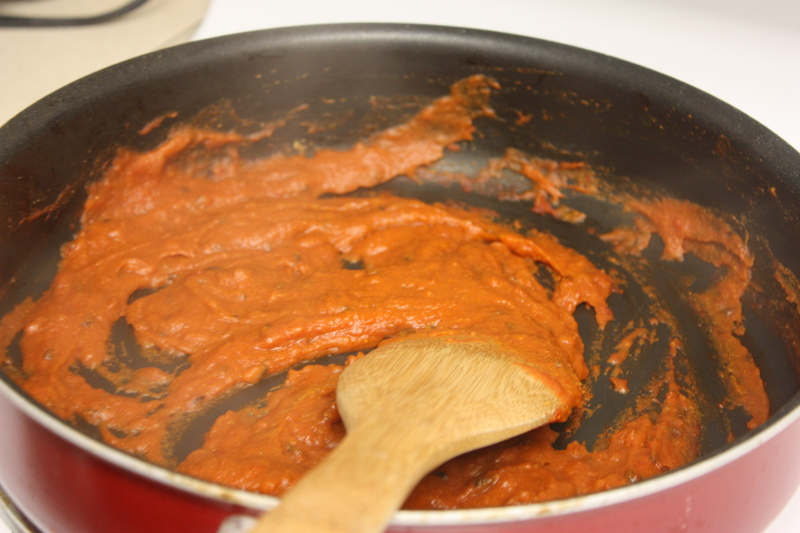 Then we added the tomato puree and ginger and let that cook for a few minutes. Once the tomato sauce reduced by half, we added the spinach and a little bit of water (I saw her do this in the video that’s why I did it too) and covered it and let it simmer on medium/low heat for about 10 minutes. In the meantime, we combined the cream and flour in a small bowl. 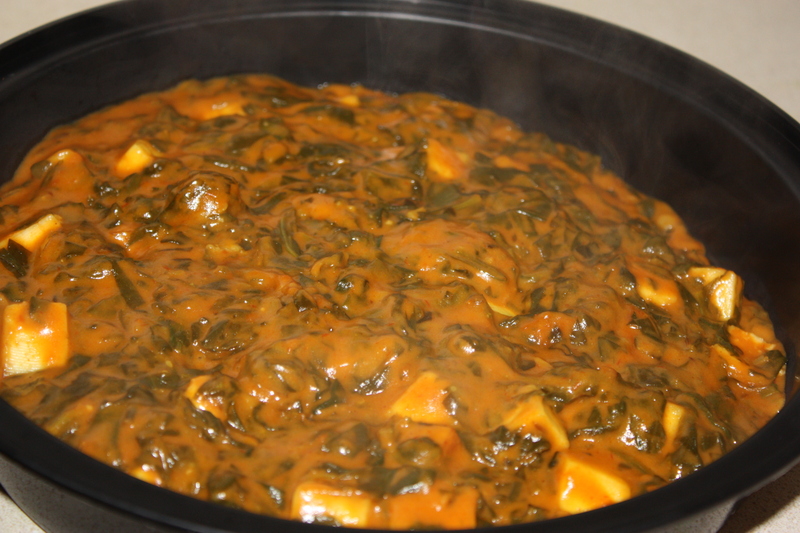 After the spinach mixture has simmered, we added the cream mixture and let it cook for a few minutes. Then cover it again and let is simmer for about 5 minutes. Then added the paneer back and and let is simmer for a few more minutes! Then it’s ready to eat! Ours didn’t look quite right but I think it was the lack of blender. It still tasted great! 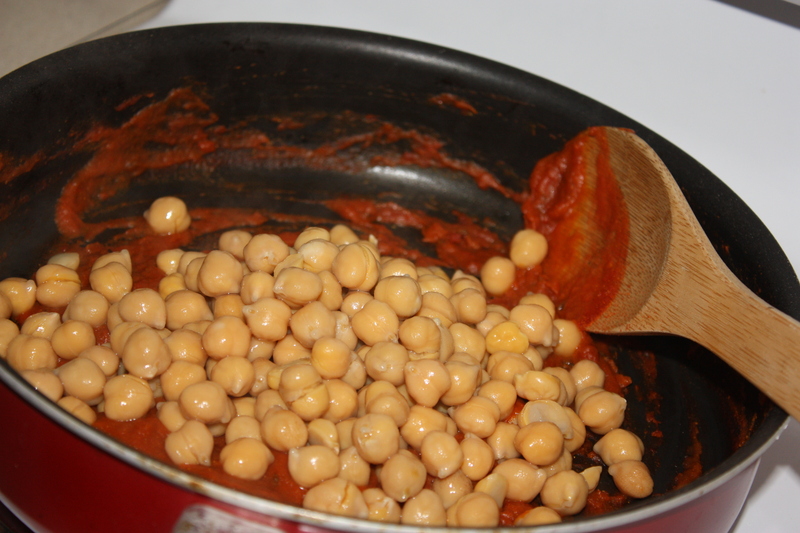 Next we made the Channa Masala. 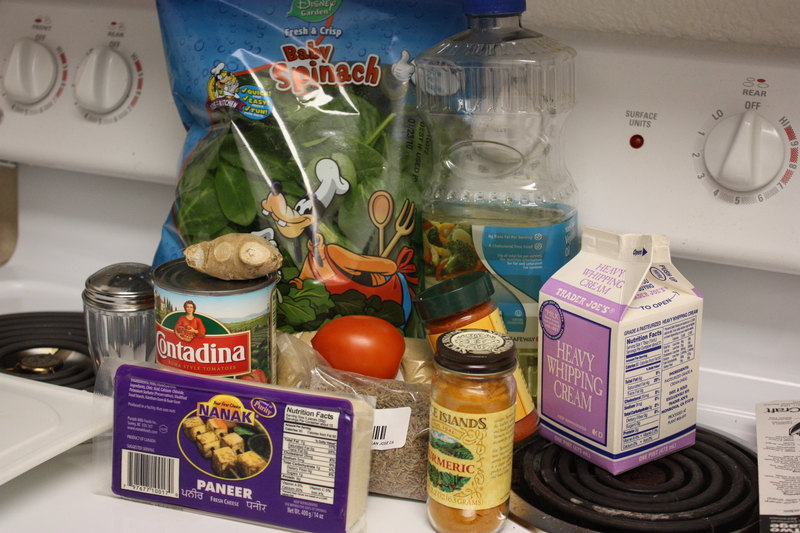 Again we didn’t have all the necessary equipment (mainly a blender and measuring spoons so I eyeballed it all and just finely chopped all the ingredients). 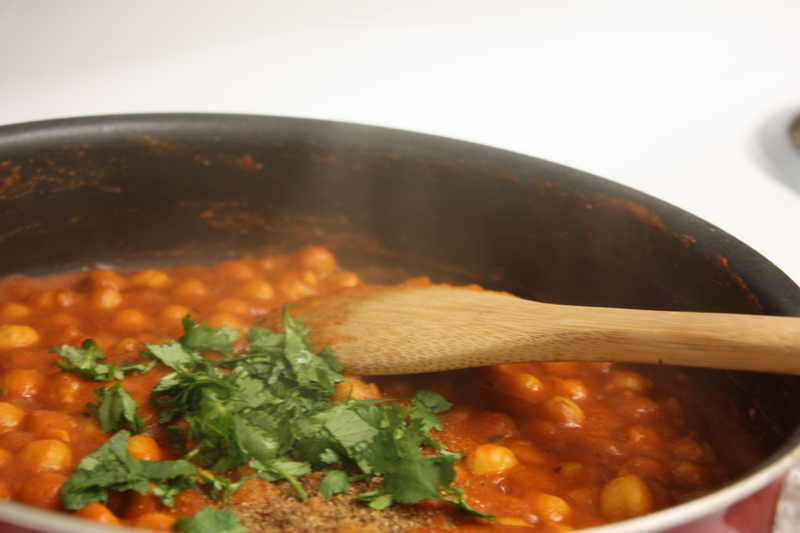 Also note that the channa masala is also vegan! I forgot to take a picture of all the ingredients for this one but they were kind of similar to the Palak Paneer ingredients. First, we heated the oil in the pan. 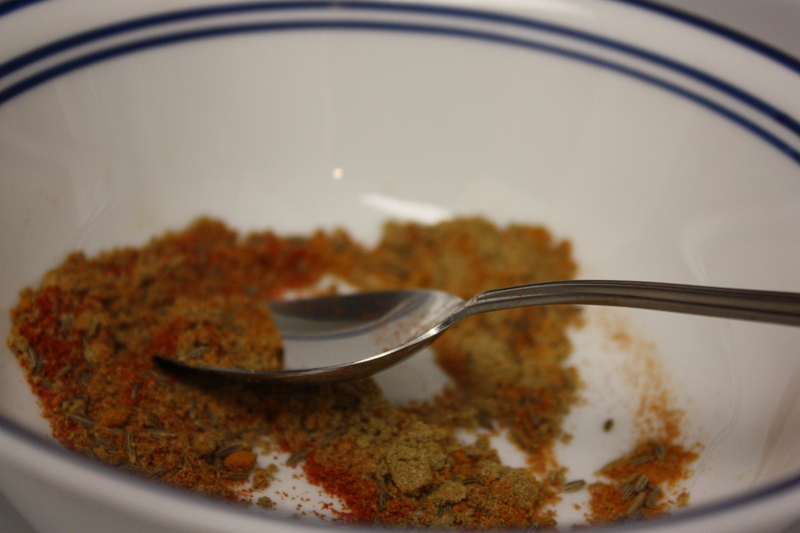 Once the oil was hot, we added the cumin seeds and cooked them til they made a cracking noise. Then we added the flour and cooked it for about a minute. Once that had cooked for a minute or so, we added the tomato puree, ginger, green chili, coriander, turmeric and red chili powder. 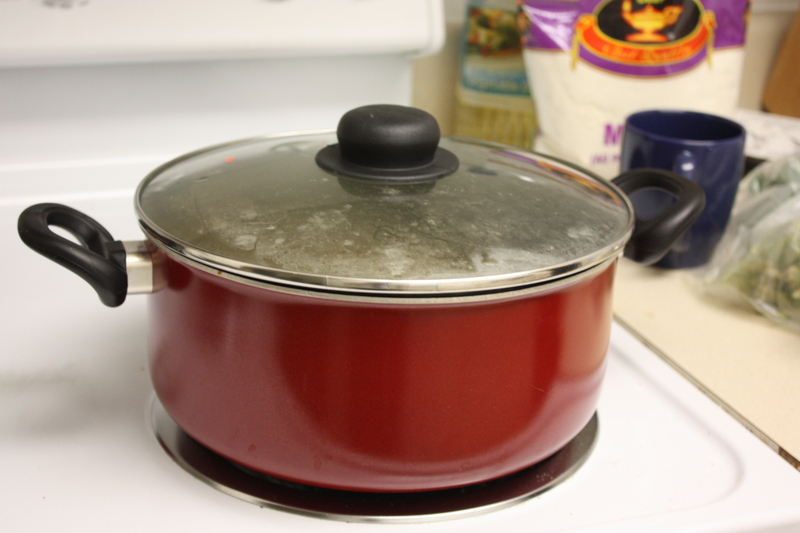 This simmered for about 4 minutes. Then we added the garbanzo beans plus 1/2 cup of water and let that simmer for about 7-8 minutes, stirring every so often. 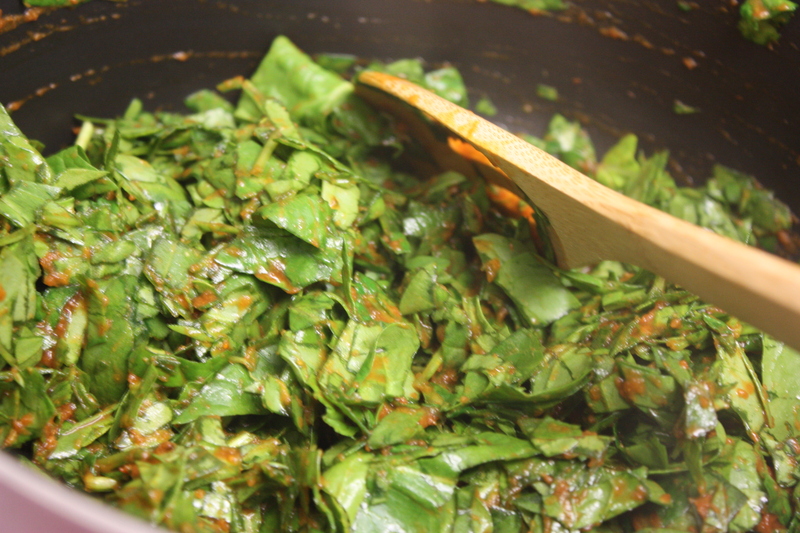 Lastly, we added the cilantro and garam masala and let that cook for a minute and it was all ready! Serve with rice, naan, raita, tomato slices or anything else you like! We enjoyed these two fabulous dishes with some Naan we got at Costco (the Costco here sells a ton of India products… large Indian population I guess…). I thought this was very delicious! The lovely fella liked it too! The Channa Masala was a little too spicy for him but nothing a little water couldn’t fix. We actually realized we pretty much doubled the green chili, so it was extra spicy. I thought it was perfect but I really like spicy food. I know Indian food sounds intense and complicated (or at least it did to me) but give it a try! It really wasn’t that difficult, just requires a bit of ingredient hunting! Tomorrow I’m headed back to LA then Friday I go back to Ithaca! I don’t want break to end, but I have a little bit of a blog revamp coming when I get back to Ithaca so stay tuned for that! That looks so great! 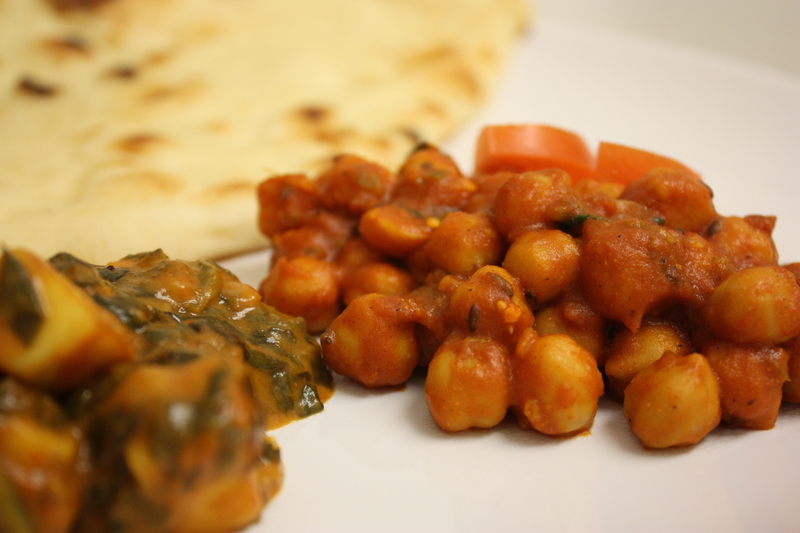 Indian food is my favourite and I could die for channa masala! 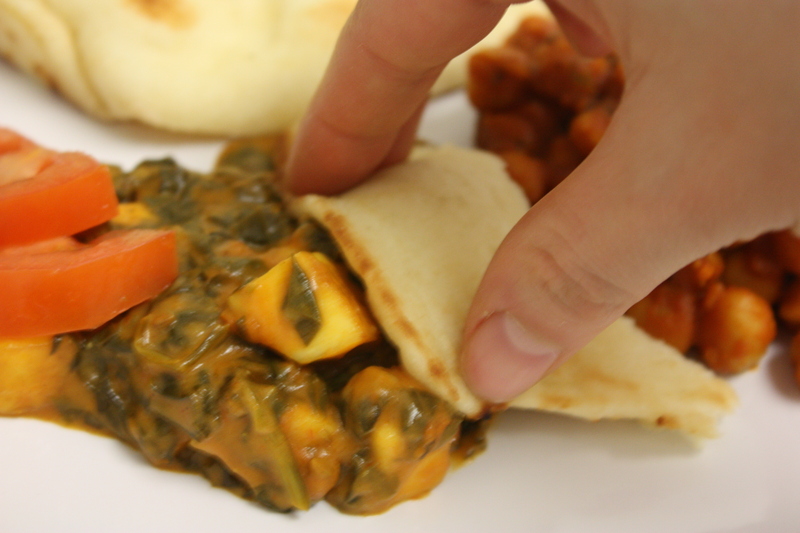 I’ve never made palak paneer at home but maybe I should give it a try :). This looks SO good!!! 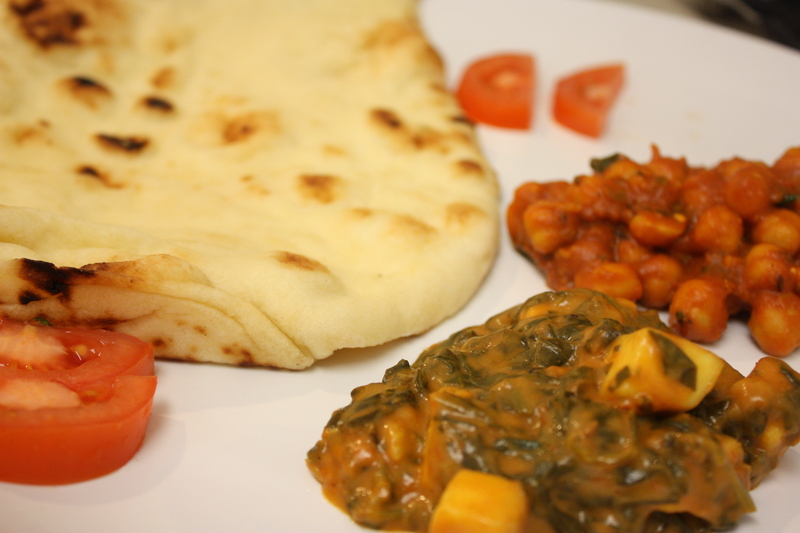 Indian food is one of my FAVES, and yours looks just as good as any restaurant dish. Great work, Karla! I’ve always wanted to make my own Indian food. My dad makes an amazing curry but he’s never ventured to other dishes. They look so professional/authentic.